Information about BAKSON'S Under Eye Cream UNDER EYE CREAM Minimises dark circles INDICATIONS Enriched with the goodness of essential oils, Aloe vera, Arnica and Cucumber extracts, it revitalizes the skin around the eyes, making it appear brighter and smoother. It reduces puffiness, minimizes dark circles fine lines around the eyes, nourishes the skin gives it a fresh look. Directions for use: Take a small, pea size amount of the cream rub it onto your skin around the eyes using circular motion. Massage it for about 5 mins leave for sometime. Apply twice daily. Note: These cosmetics are naturally safe and easy to use. Presentation: 50 gms. Note: Do not self medicate. Please consult your physician for proper diagnosis and prescription. 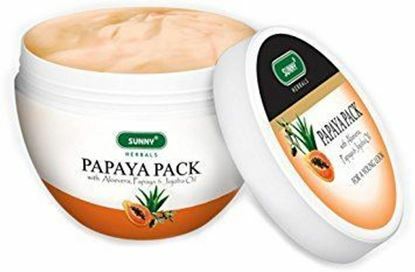 Information about BAKSON'S Papaya Pack with Aloevera and Papaya Jojoba Oil PAPAYA PACK (with Aloevera, Papaya Jojoba Oil) For Clear Young Skin Papaya is a great skin firming and anti ageing agent. Enriched with the goodness of Aloevera and Jojoba, Papaya pack nourishes the skin, cleanses it, tightens the pores and improves complexion by removing blemishes and pigmentation marks. Directions for use: Wash face and pat it dry. Apply a generous amount of Papaya pack on face and neck, leaving the area around eyes. Rinse face after 15 mins. with fresh water. Presentation: 150 gms 500 gms. Note: These cosmetics are naturally safe and easy to use.